How Many T Shirts is Lisa Wearing? It’s our Friday giveaway quiz! 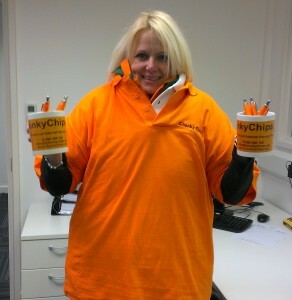 Lisa in our Sales department has decided to put on our full stock of spare ChunkyChips T shirts. Can you guess how many she’s wearing? One lucky winner will win two limited edition ChunkyChips builders mugs, a plethora of disturbingly bright orange pens, plus an 8GB Chunkychips USB stick/bottle opener. Just go to Twitter, follow @chunkychipsnet and tweet your guess to @chunkychipsnet and we’ll let you know if you’ve won on Monday 3rd February. ChunkyChips are pleased to announce a further drop in Leased Line pricing this week, with standard Leased Line pricing for 100Mb 1:1 Fibre Leased Lines now dropping below £500 in metro areas. Commented Dan Slay, Technical Guru for ChunkyChips, “This pricing breakthrough is typical of our approach to business: we recognised a requirement from our customers for cost-effective, business-class leased lines and were the first to jump on the challenge and make this happen. We have been negotiating with our Wholesale Partners to deliver truly groundbreaking pricing. Finally we are able to offer Fibre Leased Lines with free install and from under £500 per month as our standard offering”. ChunkyChips have now completed adding a multi-core Openreach fibre line with capacity and scalability for hundreds of new customers access points on demand. This multi-level connectivity means Data Centre customers now have direct access to hundreds of access providers via their own dedicated channels if required.